Container loaded at 68” above floor level via customer’s existing fork lift. 121″ discharge height, 37½” discharge projection at 60° discharge angle. Elevated load design provides higher discharge at a reduced cost. 304-2b stainless steel pour hood with continuous TIG welds. Pour hood includes 14” square roller slide gate with discharge nozzle. 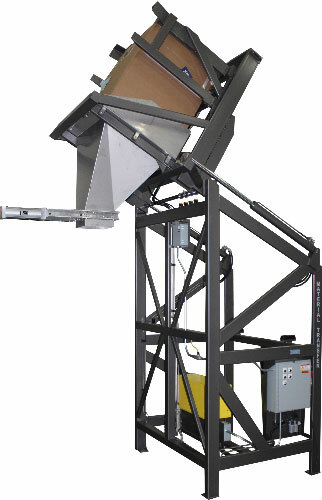 Lift & Seal™ System hydraulically seals container to pour hood to prevent product contamination. Sanitary, wash-down design features no tube penetrations. Carbon steel framework is cleaned, primed, and painted Steel-It™. 5 HP/5 GPM Parker hydraulic system with MTS exclusive two-speed circuit for a smooth, controlled rotation.